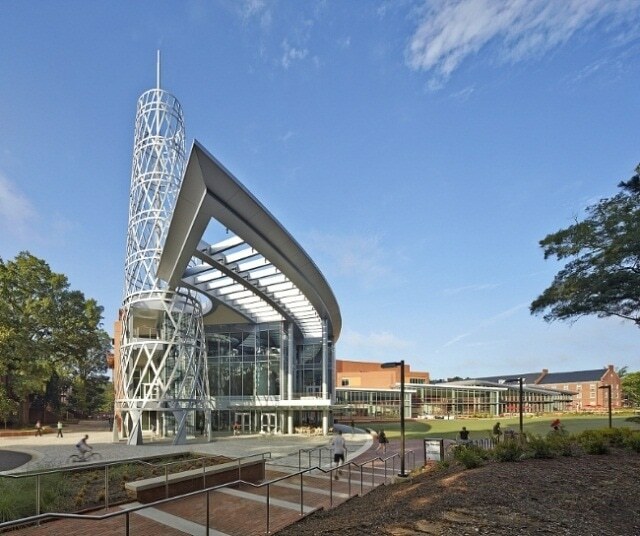 Duda|Paine Architects, a premier international design firm, has won the Association of College Unions International (ACUI) 2016 Facility Design Award for its renovation and expansion of Talley Student Union on the campus of North Carolina State University. ACUI honored Duda|Paine for its excellence in design at a ceremony on Tuesday, March 22. The landmark campus center was selected based on its impact on academic and student life experiences. "Talley is the main hub for student life at N.C. State University; the design's infusion of technology, sustainability and flexible spaces creates a destination for connection and engagement on campus," explains Turan Duda, Founding Principal, Duda|Paine Architects. "As a N.C. State alumnus, the project had personal significance, which also allowed our team increased insight into N.C. State's needs. The university's vision was always to create a building to attract and retain the best students, faculty and staff." Duda|Paine Architects was tasked with creating a center for NC State student life by providing vital collaborative spaces, revitalizing student attitudes and creating a hub that ignites enthusiasm and inspires campus spirit. Talley Student Union, which opened in May 2015, exemplifies how adaptable and flexible architecture and interior design can foster comfort, creativity, engagement, achievement and spirit across the university community. The building boasts social areas with fireplace lounges and games in addition to study spaces, flexible classrooms, offices, meeting rooms and conferences spaces. ACUI is a nonprofit educational organization that brings together college union and student activities professionals from hundreds of schools in seven countries. The annual ACUI Facility Design Awards were created to encourage and recognize excellence in the design of student-centered facilities that support campus community building and student learning.